In the article Food Storage Basics: Step 4 — Non-Food Items I explained the importance of storing non-food items as part of your emergency essentials. However the ultimate long-term solution is learning the skills to be self-reliant. That way you’re not dependent upon your supplies. How To Make A Circle Pad: When the sides fold in they make a wing unlike any other pad out there. There is no way they can leak! Cloth Pads: Winged snapped cover with folded liner insert. Beveled Pad Tutorial: Several layers sewn together for inner liner, has wings. Homemade Sanitary Pads: Making decisions between groceries or sanitary pads is not a pleasant place to be so I was tickled when another mom shared a link to homemade pads. I ran some simple ones up on my sewing machine that day and have pretty much been a convert ever since. Cloth Pads For Dummies: They do take a bit of effort but the benefits far outweigh the negatives. Cloth Menstrual Pads: Once you try a cloth menstrual pad, you will never go back to plastic again. Don’t you deserve to wear cloth too? Make Your Own Cloth Pads: Cloth pads designed for custom absorbency and there is no need to have a serger machine to make them. These are turned and topstitched pads with custom absorbency sewn in, and you also have the ability to add in extra inserts for heavy days. Pauline’s Free Cloth Menstrual Pads Sewing Pattern: These washable cloth menstrual pads are quick and easy to make, and very comfortable to use. Plus, they’re cute! Many Moons Pad Pattern: This page is dedicated to providing instructions on how to sew your own washable pads. They have been redesigned several times over the past years to provide maximum effectiveness and ease of use. Give them a try, make as many as you want – use them!…give them as gifts!..most importantly, have fun!!! The more cloth pads out there the better for the health of women and our planet! 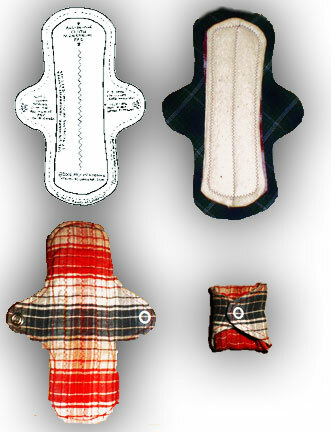 Instructions for Cloth Menstrual Pads: Design with snapped wings (or buttoned if you prefer), also details a pattern layout for getting the most pads from fabric that you can. Washable Menstrual Towels (pdf): Includes instructions for how to wash and care for fabric menstrual pads. Patterns include a winged wrap and liner. Menstrual Pad PatternsThese pad making patterns are provided here for use by the home sewer to make pads for themselves. women of virtue is a community based organization and its main purpose is eradicating poverty amongst other project.We believe this knowledge will helpfull to us so us to disseminate it the community members.THIS CAN MAKE A GIRL CHILD FROM A POOR ENVIROMENT GO TO SCHOOL 30 DAYS IN A MONTH > WHOLE TERM. It is called a sanitary cup. It is very flexible and shaped like a small funnel. It is reusable and will save loads of time (shopping), money and energy. I have found it on two sites: http://www.Divacup.com and also on Gladrag.com. By the way, the tutorial on the homemade pads on this site was terrific. Thought you’d like to know. Stay sharp and stay safe everyone. Thanks for the links Terry. I’ll have to point my wife in their direction. I’m so glad to see this. I used cloth pads after I had my son. I don’t know why I didn’t think of using them for monthy’s. I guess you get so used to doing something….. But I do remember how much more comfortable they were. I will definately be switching over! Thanks for thinking of us woman too! I’ve been using cloth pads for 8 yrs now, and couldn’t be happier. I made them myself out of old clothes after my baby was born, and money was tight. The same ones are still going strong after all this time. They don’t need much in the way of extra attention, just wash them like regular laundry. i use menstrual cup and it’s really great!! I’m from Argentina and they made it here.